Crunchy meringues. Something magical happens while glossy peaks of meringue slowly dry out in the heat of the oven that makes the cookie give way with a crunch before dissolving into sweet nothingness on your tongue. This perfection eluded me for ages until some three or so weeks ago when I shared with you crispy crunchy meringues. For purposes of making meringue SCD, I found that it’s best to make Italian meringue in which a hot syrup is added to softly whipped egg whites and beaten till stiff. It’s choice for those who are following the Specific Carbohydrate Diet (SCD) or are avoiding refined sugar in general and use honey as a sweetener. I’ve tried making meringue with honey in its natural state and have not had exactly satisfactory results with it as honey is a humectant, which means that it holds moisture. Honey is also heavier than whipped egg whites and it would make it difficult to sufficiently fold it in without fear of deflating the egg whites. In my recipe, the meringue is made with a hot syrup using just honey and water and pouring that into soft peak egg whites, beating until stiff. Italian meringue is similar to candy making, specifically marshmallows, so it is more involved and needs precision. Despite being more involved, however, its execution is easy. The original article I wrote on this – which I mentioned in passing in my first meringue post – was simply a piece that expounded on science. I delayed it initially by a week, tweeting that I wanted to add more photos and possibly video, if I could; things got in the way, though, but I’m glad they did because it allowed me to further tweak the article and sit on it to make it informative while at the same timeshow what I was explaining by incorporating the science into an instructional and informative how-to, which I am now presenting to you. Basically, as if I were personally showing you how to make this while explaining the science. Think Harold McGee or Alton Brown. Implemented with the instructions for making meringue are the scientific explanations in italics – which I also hope should answer anyone’s questions that they have had about the process and add ease, especially for those who have made the crispy crunchy meringue cookies recipe before. There are many variable factors in what can make a meringue rock or flop that even include weather conditions (it’s generally recommended that meringue is made on a dry day) but once you have mastered meringue, you can make a whole range of meringue-based desserts including pavlova, macarons, marshmallows (that use egg whites); use it as topping for a pie such as lemon meringue, make buttercream and seven-minute frosting…the list goes on. One thing’s for sure, knowing how to make meringue is a skill that’s sure to impress. The recipe we’re using is the same one that I blogged back in January. Instructions follow after the video. large stainless steel bowl and balloon whisk to whip the egg whites if you’re doing this by hand like me, or a stand mixer or electric hand mixer with a whisk attachment. A candy thermometer is not 100% necessary as there are those who have used the soft ball test without a thermometer, but I don’t recommend you do this unless you are experienced in candy making and or have made meringue this way before. Cook about 1/2 cup honey [see head note in italics] and 1/3 cup water, without stirring, in a small pot over medium heat until it reaches 235 to 240 degrees (hard ball stage) on a candy thermometer. This is your hot syrup. Absolutely do not increase the heat to speed up the process or if you think that it’s taking too long to cook or will not reach the correct temperature; even a slight increase in heat will cause the honey’s sugar structure to dissolve too quickly. It has to dissolve and cook slowly. Once the syrup has reached 225ºF, beat 2 large egg whites with a pinch of salt and 1/2 teaspoon ice cold water to soft peaks. This is possible because of an egg’s cell structure of long chains of amino acids that are hydrophobic (water-repelling) and hydrophillic (water-loving), respectively. When the egg whites are beaten, as they start to foam the protein structure of the whites start to uncurl and stretch, revealing these amino acids and a furious battle occurs in which the hydrophilic amino acids are attracted to the protein and as these molecules get closer to each other, the water molecules shove out the hydrophobic amino acids. Also by adding a small amount of water, the egg whites transform into a frothy foam more quickly than those without added water. When the syrup is done, remove from heat and immediately pour into the soft peak egg whites in a slow, steady stream while continuing to whip the egg whites at the same time. If you’re doing this by hand, at this stage it would be helpful to have someone pour the syrup in while you whip it in the egg whites. Click here to download to your mobile device or save to your computer. Wow, amazing job Zoe. You rock! This was a great read. Can I use egg replacer? HAHA! Just kidding. One treat we won’t be able to adapt. Thanks, Kim! It’s super easy. how long and what temp do you bake the meringue at? is there a printable version of this recipe anywhere? Hi Maria, yes there is! I’ve been updating the entire blog with printer friendly recipes. I’ve just updated this post with one you can download or print. Hope it works for you! I was wondering if you can make the meringue with any other ingredient but sugar based ones. I was thinking if you could add mustard or curry powder or something savory to the egg whites and then bake them they could be delicious with an entree of fish or ???? but will the egg whites perform as they do with the sugar added? Hi Noell, I’ve never made savoury meringues so I can’t vouch for it but the idea is intriguing. I’m not sure if making meringue without sugar is possible, as the sugar (or in this case, honey) stabilizes the whipped egg whites. Perhaps a meringue could still be made with sugar/honey and made savoury? Meringue is a great canvas and flexible for many desserts, so savoury might work. If you try this, I’d be happy to hear your report! Hi Karel, this recipe is refined sugar-free, i.e. granulated sugar. That’s what sugar-free usually means in recipes. Please refer to Elaine Gottschall’s book Breaking the Vicious Cycle, in which she explains the different forms of sugar. Honey is a monosaccharide or single cell sugar. To be technically sugar-free means using no form of sweetener at all, including fruit since all fruit has naturally occurring sugars and no starches as well because they convert to complex sugar, which is why they’re forbidden on the SCD. I hope that this addresses your concern. Thanks for the recipie and mini-science lesson. I learn’t a thing or two about egg whites. I also think your decision to intersperse the technicalities within the recipie is a good one, it makes a potentially big and confusing post readable and relevant. I had maple syrup on hand (the proper stuff, grade B) and used it instead of honey. I didn’t make a hot syrup, I just slowly poured it in while whisking once the eggs were at the soft peak stage. It would’ve been around 1/4 cup and the Meringues turned out very sweet so next time I think I’ll be using half that. I did the whisking by hand and the eggs were at the stiff peak stage within a few minutes after adding the maple syrup. I also followed a different baking routine. After baking at 150 C (~250 F) for 50 minutes the meringues were as golden as I wanted but still very soft. I switched the oven off, opened the door and left them to cool and dry out as is often suggested. After two hours they were still soft so I did a bit more reading online and found that some chefs recommend ‘drying’ (note, not baking) Meringues in a very low oven for many hours. I switched the oven back on to 50 C (~120 F) and left them for another five hours. Hey presto! My first ever batch of Meringues were ready and had actually turned out crisp, delicate and delicious. I was very happy with the end result and other than the revised baking method (low temperature for a long time) and less syrup, the only thing I’ll be changing is placing them on some baking paper rather than on a pizza stone. I had to lop the bottom of the Meringues off as they’d firmly fused to the stone! Hi Dames, thank you for the feedback! I haven’t written a post like this again yet, but if I ever should I’ll keep your comment in consideration re: interspersing the technicalities within the recipe. 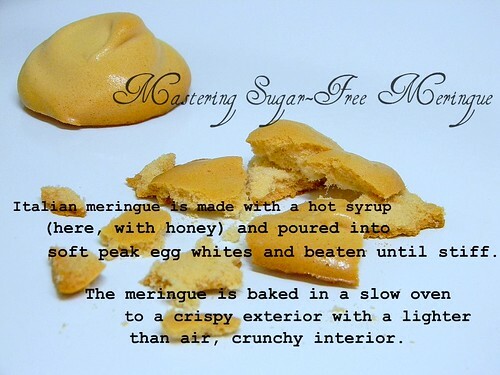 I would like to try making meringue with maple syrup, but just haven’t gotten round to it – so I’m glad to hear that it works. I always use parchment paper, for nearly all my baking; the only time the meringue has stuck to it is when it isn’t done yet (sometimes the top can be soft, especially if you’re making bigger meringues, but as long as you can peel off the bottom it’s good). Rather than liquid honey, have you thought about using dried honey (granules). Another option might be maple sugar (granules). The consistency would be similar to refined white sugar (but yummier and a more natural alternative). I have thought of using dried honey before, but just haven’t found it in my area. Maple sugar would also be great! Cathy…All Granulated honey I have found has refined sugar or evaporated sugar cane crystals. So be sure to watch that if you are going refined sugar-free! Get free email updates sent straight to your inbox. Enter your email address to receive notifications of new posts and recipes from Z's Cup of Tea.